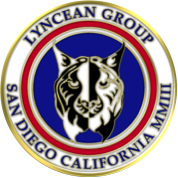 You can access the first part of “Pulp Fiction” at the following link and then easily navigate to the other two parts. NRDC examined three cases of cumulative emissions from fuel pellets made from 70%, 40% and 20% whole trees. 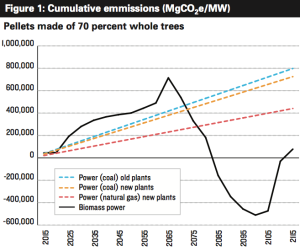 The NRDC chart for the 70% whole tree case is shown below. 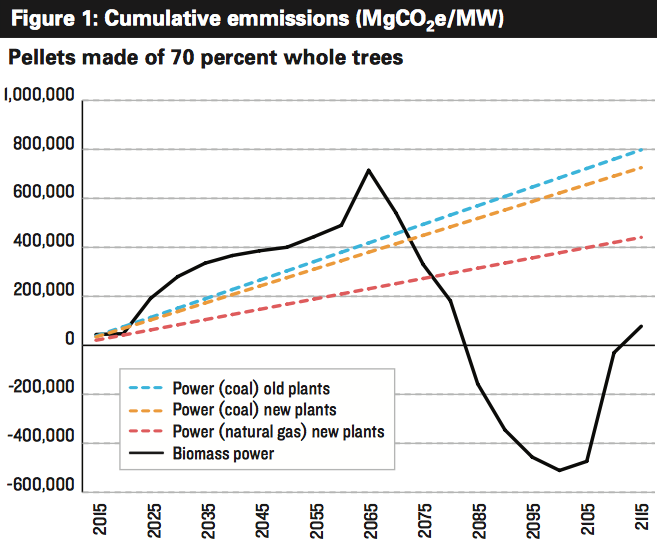 You can see that the NRDC analysis indicates that cumulative emissions from burning wood pellets exceeds the cumulative emissions from coal and natural gas for many decades. After about 50 years, forest regrowth can recapture enough carbon to offset the cumulative emissions from wood pellets to below the levels for of fossil fuels. It takes about 15 – 20 more years to reach “carbon neutral” (zero net CO2 emissions) in the early 2080s. The situation in the U.S. The U.S. Clean Power Plan, Section V.A, “The Best System of Emission Reduction,” (BSER) defines EPA’s determination of the BESR for reducing CO2 emissions from existing electric generating units. 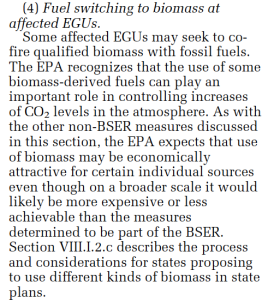 In Section V.A.6, EPA identifies areas of compliance flexibility not included in the BESR. 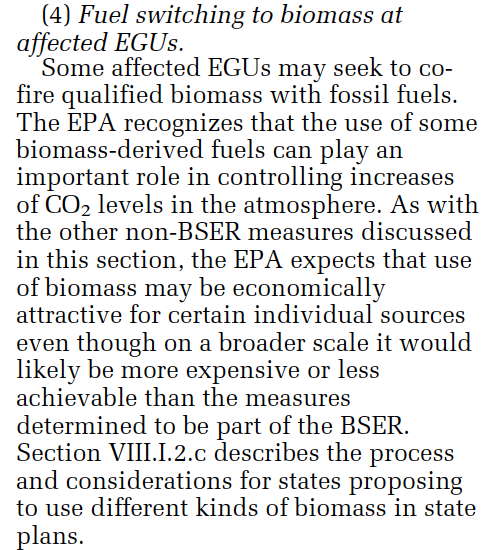 Here’s what EPA offers regarding the use of biomass as a substitute for fossil fuels. This sounds a lot like what is happening at the Drax power plant in the UK, where three of the six Drax units are co-firing wood pellets along with the other three units that still are operating with coal. Fortunately, this co-firing option is a less attractive option under the Clean Power Plan than it is under the EU’s Renewable Energy Directive. On 9 February 2016, the U.S. Supreme Court stayed implementation of the Clean Power Plan pending judicial review. The character J. Wellington Wimpy in the Popeye cartoon by Hy Eisman is well known for his penchant for asking for a hamburger today in exchange for a commitment to pay for it in the future. It seems to me that the EU’s Renewable Energy Directive is based on a similar philosophy. 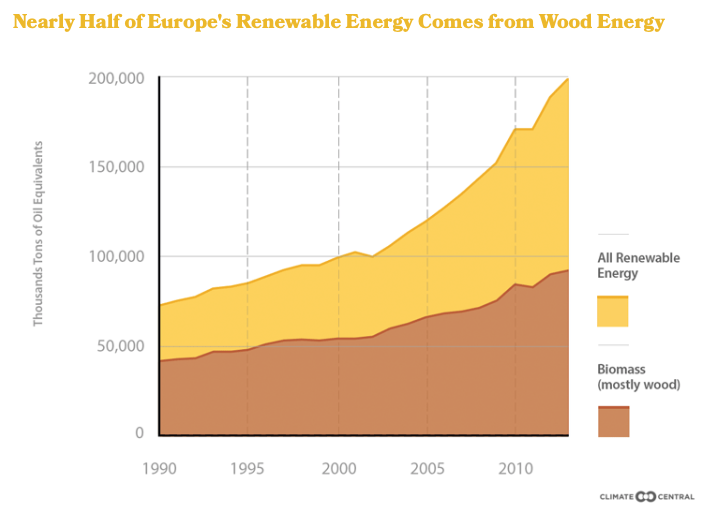 The “renewable” biomass carbon debt being accumulated now by the EU will not be repaid for 50 – 80 years. The EU’s Renewable Energy Directive is little more than a time-shifted carbon trading scheme in which the cumulative CO2 emissions from burning a particular carbon-based fuel (wood pellets) are mitigated by future carbon sequestration in new-growth forests. This assumes that the new-growth forests are re-planted as aggressively as the old-growth forests are harvested for their biomass fuel content. By accepting this time-shifted carbon trading scheme, the EU has accepted a 50 – 80 year delay in tangible reductions in the cumulative emissions from burning carbon-based fuels (fossil or biomass). So, if the EU’s Renewable Energy Directive is acceptable for biomass, why couldn’t a similar directive be developed for fossil fuels, which, pound-for-pound, have lower emissions than biomass? The same type of time-shifted carbon trading scheme could be achieved by aggressively planting new-growth forests all around the world to deliver the level of carbon sequestration needed to enable any fossil fuel to meet the same “carbon neutral” criteria that the EU Parliament, in all their wisdom, has applied to biomass. If the EU Parliament truly accepts what they have done in their Renewable Energy Directive, then I challenge them to extend that “Wimpy” Directive to treat all carbon-based fuels on a common time-shifted carbon trading basis. I think a better approach would be for the EU to eliminate the “carbon neutral” status of biomass and treat it the same as fossil fuels. Then the economic incentives for burning the more-polluting wood pellets would be eliminated, large-scale deforestation would be avoided, and utilities would refocus their portfolios of renewable energy sources on generators that really are “carbon neutral”.